Fake photographs have been around for almost as long as the camera, but in a digital age of photography, the ability to alter images has never been easier. EU Forensic Video Expert David Spreadborough examines the current challenges surrounding authenticating images. Thanks to the latest administration in the USA, the term ‘fake news’ has become a popular method of explanation to an event created within social media. The problem is that news agencies and websites find these invented stories and then republish, therefore causing the spread and proliferation of the fake story. 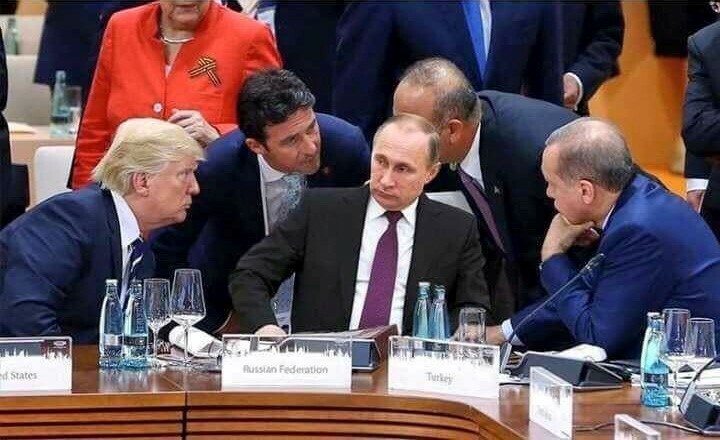 You may have seen this image recently during the G20 meeting of world leaders. Looks like a serious conversation. It may have been, but Putin was never there. Find a picture, create a story, ‘Photoshop’ the picture, then tweet it. The fake news cycle then starts. The more relevant the story, the quicker the spread. The modification of images to tell a different story is nothing new, it’s been happening since the early days of photography. A popular myth is that it’s a problem caused by the digital age. An example is the photo of The Cottingley Fairies. Although I accept that digitisation has made things a lot easier and a lot more convincing. Over the past few months, entwined between the ‘fake news’ stories have been several reports of manipulated images appearing in academic studies. It is easy to understand how people can be swayed to change a couple of images to validate a piece of research if it assists in the success of a financial grant. Images in documents used to prove qualifications and images proving the existence of large, wild cats in southern England have also all recently been found to be fake, or maliciously manipulated. When someone fakes an image, it is simply to present an event in a different way than the original moment in time. To be able to present an image in court someone is required to document the image creation. It is here where the challenge for the legal system lies. I spent the last 12 years of my police service investigating imagery. Mainly from CCTV systems but most types of images cropped up at some point; scanned images, screen captures, cell phones and even one or two originating on a wet film. What always surprised me though was how easy it was, and still is, to enter an image into evidence and for that image to then be immediately relevant within the investigation with very little ‘error checking’. With CCTV images, the manipulation is not usually malicious but caused by poor compression, incorrect capture and processing, and then the wrong interpretation. As the CCTV user commonly knows very little about such matters, their ‘statement’ relating to the creation of the video export means very little when it comes to authenticating it as a true and accurate representation of that moment in time. The same goes for the officer who screen grabbed or exported the frame to create the digital image. In just the same way as the CCTV owner, in that they can say that it is a specific scene covering a certain event, many first responders are often not able to identify errors that could affect the authenticity such as compression artefacts, lighting errors, aspect ratio or lens distortion. It is for these reasons that forensic video and image analysts are often asked to analyse and prepare the images first, ensuring the correct interpretation and presentation of the true image to the court. How do we then authenticate an image that has been directly taken by a witness or suspect? Perhaps on their cell phone, digital camera or even scanned. A question most officers ask witnesses, victims and even suspects is, “Did you take any images of the incident?” They then produce that image and it is presented as fact. It is often easy to miss the obvious. It is not the human eye being fooled, it is the fact that we see what we want to see and our mind plays tricks on us. For example, often by the time we view the image we have already listened to a story, and maybe even read an account. The consequence is that we now unconsciously add that story into the image we are viewing. Who checks it then? Who confirms the context and history of the image? Who performs the analysis to ensure that it does match what the person states with regards to the image creation. Most importantly though, who reviews the image for signs of malicious manipulation? If we are aware of fake images being presented in the media, within education, within private claims and employment cases, why do so many continue to dismiss the possibility that fake evidence exists? In a time where more and more crime reports are taken over the phone and then communication is maintained via email, there are many crimes where an officer is simply unable to attend. After successive governments have squeezed policing to the verge of collapse, it’s not difficult to see how images can be submitted but never physically checked for their authenticity. The images are just trusted by default. It’s now time to start asking some questions. Is there any reason why the person submitting the image would want it to portray another scenario? The image of the victim’s bruise; the image of the damage; the image showing the suspect in a certain location. If you can think of a reason, then the image should be authenticated prior to it being presented as fact. Images are often submitted to forces during major incidents. You have probably seen the requests and dedicated websites giving witnesses the ability to ‘send in your images’. These are great, and the speedy analysis ensures investigative leads and actions can be quickly directed. But are there people that will submit images and state that they were there, when all they have done is create a fake image? Camera matching, meta-data analysis, compression analysis, error analysis: the process of image authentication was once a minefield of scientific research papers, mathematical algorithms and various pieces of software that all required a PhD to understand. In 2014, things changed when Amped Software, an Italian-based forensic image company, developed a product that linked all available image authentication methods into a single application. With a short training requirement and a simple workflow, the challenges of image authentication disappeared overnight. Amped Authenticate has quickly become the de facto application for image authentication and is so crammed full of tools, filters, and unique functions that it would take another page to list them. I’m not going to though, that’s not the purpose of this article. My aim, as an investigator and a trainer, is to ensure that people start asking the question, “Is it authentic?”. If you ask the right questions, then software can help you find the answer you require. This entry was posted in Announcements, Authenticate, Press / Media on August 25, 2017 by Darlene Alvar.